The Teamsters at the Northwest Mosquito Abatement District (NWMAD) have been working hard this winter to prepare for another season of protecting the public from summer’s most annoying and dangerous offender: the mosquito. The NWMAD covers 242 square miles of Cook County, including 10,502 above ground water sources and 80,000 catch basins. The main goal of the NWMAD is to protect the public from infectious diseases like the West Nile Virus, and to stop nuisance mosquitoes from multiplying. 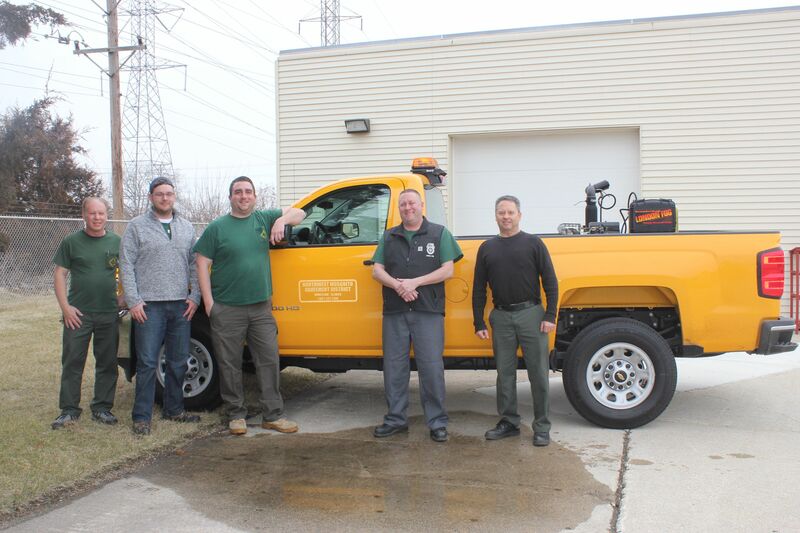 While there are seasonal employees that work in the field during the spring and summer months to spray land and trap mosquitoes, a seven-person Teamster crew runs the day-to-day operations from strategizing treatment schedules in each area to maintaining every vehicle that is used in the field. Brad Knoll started working for NWMAD in 1990 as a mechanic and has been the Teamsters Local 700 steward for the unit since Local 700’s formation in 2010. The unit was once part of Local 714 and has been represented by the Teamsters since 2000. While not everyone in the current crew has been working at NWMAD as long as Brad, he said they all “have a really good system in place” and work very well together. The Teamster group consists of an Assistant Chief of Internal Services, three Field Supervisors and three Mechanics. Field Supervisor and Tech Manager Dan Bartlett started working at NWMAD as a tech, working in the field for five years, before being promoted to the role of supervisor. “On my first day as supervisor, I didn’t have to really ‘train’ much, it was really more of a transition from being managed to being management,” said Dan. The NWMAD main operation is headquartered in Wheeling, with two other shops in Elk Grove Village and Hoffman Estates. Each year, from roughly May 1 – Sept. 30, they split up among the shops and manage operations for different sections of the District. Each shop manages crews of 20 and two workers are sent out together in each truck. The NWMAD focuses on daytime larviciding by applying pesticides to targeted water sources for prevention of mosquito larva. These treatments total about 90% of the day-to-day summer operations that the NWMAD performs, as they are the most effective means of controlling mosquitoes. When adult populations are on the rise or if there is a high threat of West Nile, NWMAD implements an adult mosquito spray program called adulticiding. The trucks go out at night to spray, which typically begins at sunset and concludes around 1 a.m.
During the offseason, the group works out of the main Wheeling shop and performs routine maintenance on every truck. They get in around five new trucks a year, and have to strip down the older trucks to get the new trucks ready for the field. Taking off the night spray equipment and installing it on new trucks, along with changing tires, repairing brakes and fixing lights is just some of the work they do during the offseason. Mapping the District and figuring out what materials and products are needed in every area is crucial for a successful season. “Every offseason, we reflect on what we did last year and how to optimize results for this year,” said Dan. In 2008, the District implemented GIS (Geographic Information Systems) to assist in mapping. The use of this technology has allowed for more detailed and spatially accurate maps for field technicians through aerial photography overlays, creation and organization of new and existing district-specific map features, and streamlined map editing process for changes found through source surveillance. Avoid being outdoors around dusk and dawn; this is when mosquitoes are most active. Wear long sleeves and pants when outdoors if you can. Use insect repellent containing 20% DEET, Picaridin or Oil of Lemon eucalyptus. Make sure you apply as directed on product label. Inspect your yard for containers that are holding water, dump them out if they can hold water up to 5 days or more. Set up a box or oscillating fan on your patio, set it to create a 7-10 mph wind. Mosquitoes cannot fly in higher winds. Make sure you have screens on all windows and doors. Avoid being in heavily shaded or wooded areas. Mosquito populations fluctuate during the summer months. On average, mosquitoes live 14-20 days. Nothing can prevent all mosquito bites, but taking these steps can greatly reduce the number of bites. For more information, visit www.nwmadil.com.